These 1/4" professional phone plugs are available in mono (2 contacts/TS) or stereo (3 contacts/TRS). 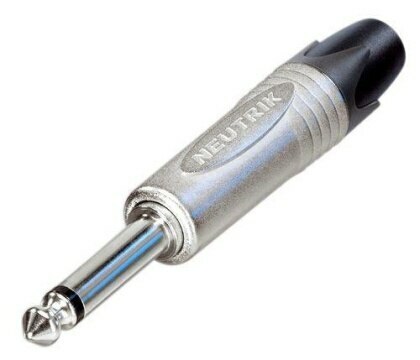 Features include a diecast metal shell and unique Neutrik chuck type strain relief. We are the wholesaler providers of different wires and cable around the country made by international technology which gives a life time support and durability. Belden 9968 22 AWG 2 pair braid shielded cable. Dealer and Whole seller ofBelden cables USA. 2 pole 1/4" professional phone plug, gold contacts, black shell The heavy duty professional phone plug series improves on the design of the existing C series by offering the thinnest available A-gauge 1/4" plug with unique Neutrik chuck type strain relief on the market. The slimline shell with a width of 14.5 mm meets the most recent requirements for highest density jackfields (15.88mm jack pitch). The precise machined one-piece tip contact without rivets makes it unique and avoids hook up in a socket or break off the tip. The Plug X Series serves all applications such as guitar applications, audio cables, snakes, speakers, amplifiers and mixing desks. Features & Benefits Extra slim 1/4" plug for highest packing density Robust diecast shell in stylish design Proven chuck type strain relief for reliable cable retention Sleek design for best handling convenience Precision machined one-piece contacts - avoid hook up of tip contact. Crimp tool die for HX-R-BNC Pin crimping: 1.60 mm Shield and jacket: HEX crimp 6.47 mm (A), 4.53 mm (B), 4.06 mm (C).. The rearTWIST HD BNC cable connector offers a true 75 Ω design and is perfectly suitable for HD applications. The patented rearTWIST boot guarantees easy access even in high density applications and offers color coding. Suitable cables: Belden 1694A (ANH), Belden 4694R, Bryant BD SD11, Canare L-4.5CHD, Clark Wire CD7506-0, CommScope 5765, Gepco VSD2001, Suhner S05163-02, Suhner S05133-07, Percon VK77 Crimp size: Pin: 1.6 mm (square) Shield: 7.36 mm (hex) Features & Benefits “rearTWIST Principle” locking/unlocking using the easily accessible soft touch boot (Patent DE 100 48507) Ideal for recessed bulkheads where access to the “head” of the connector might be an issue. These connectors turn from the back and not the front. True 75 Ω design meets the stringent HDTV / DVD requirements Leading area: Avoids tilting due to side forces to protect contacts from deformation. Guarantees a lifetime of min. 1000 mating cycles! Snug-fit center pin insert provides tactile feedback Shield and jacket crimp technology prevents the problem of an exposed grounding braid on cable assemblies Excellent cable protection and retention Precise Swiss machined brass parts for outstanding durability Accessories include color coded boots in 10 standard colors, crimp tool and dies..
Chassis connector, power-in, 3/16" flat tab terminals, blue The powerCON is a locking 3 conductor equipment AC connector with contacts for line, neutral and pre-mating ground contact. It replaces appliance couplers wherever a very rugged solution in combination with a locking device is needed order to guarantee a safe power connection. Attention: The powerCON is a connector without breaking capacity, ie the powerCON should not me connected or disconnected under load or live! Features & Benefits Locking 20 A / 250 V ac appliance coupler 3 contacts for line, neutral and premating safety ground Power-in (blue) and power-out (grey) versions with different keying to avoid the possibility of intermating Fast and easy twist lock latching system Extremely robust and reliable Ergonomic design User friendly latch design for easy handling UL, cUL recognized components, VDE certified Branded with unique hologram - guarantees genuine and authentic Neutrik product..
Made by Neutrik China factory YS231BG 3.5mm 3pole Mini Jack Plug Stereo Gold Plated Specification 1. 3.5 mm plug, 3-pole, black metal handle, gold plated contacts 2. Type: Stereo 3. Termination#1: Mini Jack 3.5mm Male 4. Specification: Hole for wire OD6.5mm, If you need Hole for wire 4.5mm, pls order YS231-BG from my shop..